Georges Braque,1882-1963, one of France’s famous artists in art history painted >“Musical forms with the Words Fete and Journal”, in 1913; the medium was oil, pencil and charcoal on canvas. He prepared his canvases very carefully as it was the foundation on which the structure of his artwork was built. Parts of his canvases were purposely left unpainted later worked into the composition unchanged as a textural effect adding to the artistic composition as a whole. In 1918 Braque painted another of his famous paintings “Musical Forms”, a collage. In this artwork Braque used real textures in found objects seen in the neck of the stringed instrument formed from corrugated cardboard. He used brown wrapping paper, white ribbed paper, pre-printed paper and other textures tying them together in a harmonious composition. Developing this technique further Braque mixed textures such as sand into his paint. At times he used thick applications of textured paints and in other instances he would scrub the paint to a thin film revealing a texture beneath. Texture became and element in his artwork complement line, form and color. Defining his creative art process and abilities as not having the skill to paint the natural beauty of a woman in the “Architectural Record, May 1910, quoted by Gelett Burgess in the article “The Wild Men of Paris”, Georges Braque said “I must therefore create a new sort of beauty, the beauty that appears to me in terms of volume of line, of mass of weight, and through that beauty interpret my subjective impression. Nature is a mere pretext for a decorative composition, plus sentiment. It suggests emotion, and I translate that emotion into art”. Another of Braque’s famous works is “Le Courrier”, 1914, a collage consisting of charcoal, pencil, gouache, paper and cardboard. A synonym for style of artwork is “Synthetic Cubism”, a reconstruction of pre-made forms into an artistic composition. Georges Braque kept a notebook or sketchpad with him constantly. He made notations putting down ideas for a time when he was strongly motivated to paint but didn’t know what to paint at the moment. Other famous painters of this period in art history are Pablo Picasso and Fernand Leger. 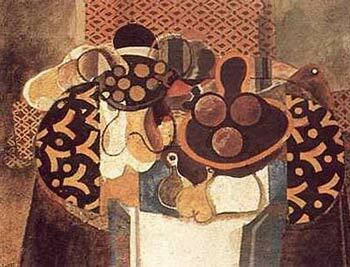 To view the gallery of Georges Braque, click here.